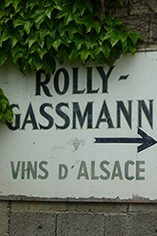 Located in Alsace’s Haut-Rhin village of Rorschwihr, near Ribeauvillé, lies the family domaine of Rolly-Gassmann, whose roots date back to 1661. The 51 hectare estate (40ha in Rorschwihr, 10ha in Bergheim) is owned and run by Marie-Therese (pictured right), Louis & their son Pierre Gassmann, along with a team of 17 workers. They work to the principles of biodynamic viticulture yet curiously also apply weed killers. They produce on average 300,000 bottles per annum and they are notable for having more than four years’ stock (1 million bottles) in stock at any one time, which would account for the regular visits by French customers; they only export 20% of their annual production. 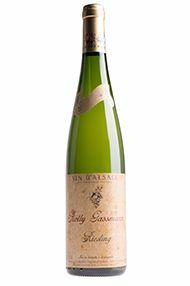 The 250ha commune of Rorschwihr, first noted for its wine in 742AD, lies on one of Alsace’s many faultlines (ala Burgundy), giving rise to a complex tapestry of 21 different soil types, particularly limestone, sandstone, granite and silt. 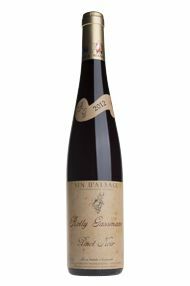 So complex in fact that when the authorities sought to lump together vineyards to form large plots as part of the new Grand Cru system (1970s/80s), the villagers rose up and declared that either there would be 12 Rorschwihr Grand Crus or none at all. Hence today there are no Grand Crus in Rorschwihr. That said there are some standout Crus/lieux-dits that would surely qualify as Premier Cru sites if ever this classification was tabled. 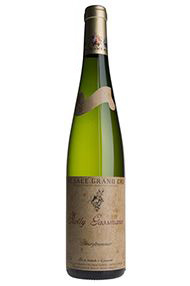 Limestone rich vineyards Silberberg, Kappelweg & Pflaenzerreben are rated for their Rieslings , Rotleibel’s darker brown clay and silt soils are meant for Pinot Gris, while the oolithic white lime stone of Oberer Weingarten & Stegreben are perfect for the Gassmann’s Gewurztraminer. Vinification takes place in large oak barrels and stainless-steel, giving wines of great elegance, gentleness and drinkability. 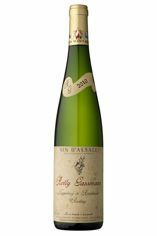 The Vendange Tardive character of this Riesling has clearly brought with it some botrytis, giving a richer, fuller, orangey appeal, yet also exqusite balance that comes with bottle age. 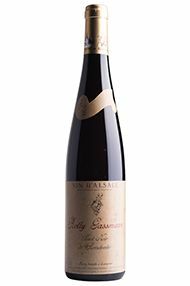 Sporting such incredible detail, lacy knickers and a prettiness that differentiates it from the Pflaenzerreben, this medium wine is gorgeous now but will develop till 2020.